When a car accident claimed her mother�s life, Bridgette Damson was rescued by a mysterious stranger. Ever since, she�s been able to see and sense ghosts. As she�s grown older, Bridgette has had dreams about the tattoos she sports on her arms. Those tattoos protect her from evil -- until the day when a dark entity brands his name into her flesh. Bridgette seeks help from a witch doctor she�s known for years. Armed with his advice, she confronts a grim reaper, Mikal, who confesses his love for her. With someone out to kill her, a grim reaper who refuses to take her soul, and a new tattoo forming on her chest, Bridgette must embrace her destiny. Before she can make sense of it all, Mikal disappears, and Bridgette is charged with saving him. Accomplish her mission will turn everything Bridgette�s ever known upside down -- including her heart. 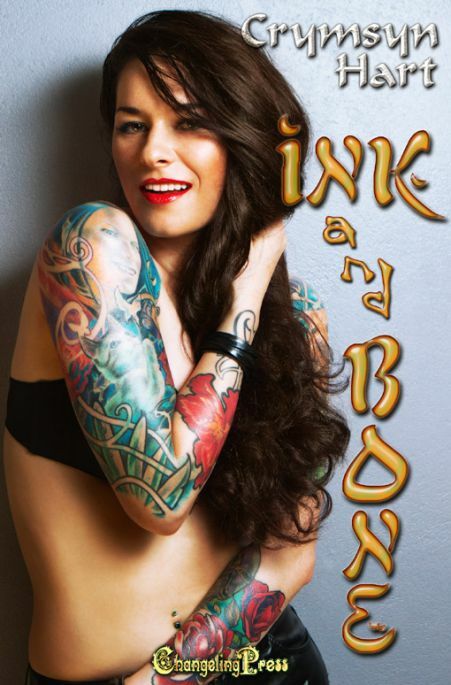 "Ink and Bone" is now available at Amazon, Barnes & Noble, Kobo, and iTunes! Once her head hit the pillow, Bridgette found herself in the familiar surroundings of a dream she had been having intermittently since she was eighteen. She stood in a sumptuous bedroom. The mattress lay on the floor surrounded by lavish pillows. There was no door into the room. A screen decorated with a forest scene stood in the corner. The scenery never changed, and she always knew what to expect from the dream. She glanced down and a long black satin nightgown clothed her. Bridgette stretched and sat down on the bed. The small motion felt good and helped ease her tension. Hands trailed over her shoulders. "You had a rough day today." She closed her eyes and leaned her head back against his chest as he massaged her muscles. His easy breaths made her feel right at home. Bridgette always welcomed these dreams. They didn't have a specific schedule -- just when she was stressed or had a lot on her mind. She inhaled and caught the faint scent of jasmine. His thumbs dug into the knots of her shoulders. When his lips trailed along her neck, she quivered from the sudden pleasure it brought. "Why do you always make me feel this good?" "I have a knowing for it. Pleasure is something I excel at." "I guess you're my dream man." He nibbled her flesh and brushed her hair away from one shoulder. From there, he slid down the thin strap of her nightie. He kissed his way down her neck. With every inch of her skin he touched her senses were ignited. It seemed he caressed the inside of her flesh and lit up her nerves. She squirmed against him. Her dream lover's hands knew every inch of her after being in her fantasies for so many years. Each time she had been with him, he took her to new heights of passion. Tonight, she needed to escape the strains of the day. His fingers moved over her tattoos. The energy he raised flashed over her skin like a quick burst of heat. She opened her eyes to watch as he traced her tattoos. Even in her dreams the tattoos remained. His fingers reached for the name branded into her skin. Bridgette pulled away from her dream man. She got up off the bed and walked toward the end of the room. She ran her hands over her arms and hugged herself. Knowing something was after her made her reevaluate everything. What if this man isn't really a dream? What if he's this thing that's been around me all my life? "What did I do wrong, Bri?" he whispered, calling her the secret nickname her mother always used for her. She sniffled. "Nothing. Forget it. I should wake up." "Tell me what's bothering you. You've always been able to talk to me. Sometimes that's what we do. Is it about the new tattoo you have?" "Something like that. Look, I should wake up and get back to reality." She knocked on the wall. Normally a door appeared. Bridgette could walk through it and wake up. Nothing materialized. She turned around and looked at him. Her dream man stood nearly seven feet tall. He had an athletic build with onyx hair that fell down his back. His smile had always been sincere. His concern-filled gaze never left hers. She wiped her eyes. "I need to know who you really are. What you really are." He opened his arms and knelt before her. "I'm yours. I won't harm you. My sole duty is to bring you pleasure. You've asked me this before. Why do you now doubt that?" Bridgette had never felt anything malicious from him. "Things are different." "Tell me. It's because of the name emblazoned on your flesh. Is this the name of a new lover and you're casting me aside?" She sunk down on the pillows before him. "No. Not a new lover. A demon marked me for his own. I went to see Zeek for some answers. In order for me to get them, he had to pull the wool from my eyes. I see things and people differently now. I haven't figured it all out really. But I need to know. Did you give me this? Are you some incubus who wants me in the flesh?" Tears trickled down her cheeks. She hated herself for crying, but it had all come to a head. He wiped her tears away and lifted her chin. He brought her hand to his chest so she could feel his heart thumping against his ribs. "I'm not evil. My only task has been to be there for you in whatever capacity you need. I-I freely admit I might've taken advantage of your flesh, but I find you irresistible." She laughed at his conviction. Bridgette always trusted him. Sometimes she wondered if had pulled her from her mother's car. When she tried to ask the question, it faded from her lips. His speech lightened her heart. "Even in this dream world I have some say in the issue of you and I being together." "Yes. If you had wanted me to leave you alone, I'd vanish or we could talk. This reality responds to you." Her dream man took her left hand and placed kisses all along her tattoos. When he came to the name, he pressed his lips upon it. "I swear I will protect you from whatever harm comes upon you. In your waking world you might not see me, but I'm there watching out for you."